The door to the reception/bar area was open, but there was only a young girl there cleaning and getting things ready to open the place later. When I told her I was leaving and I wanted to pay she told me that reception was not open yet, nor was the bar, which meant that if I was to wait, I had to do so with an empty stomach, which I did not want to do. I gave her the money for the night, told her I had spent the night in plot 83 and asked her to give the money to whoever was in charge. 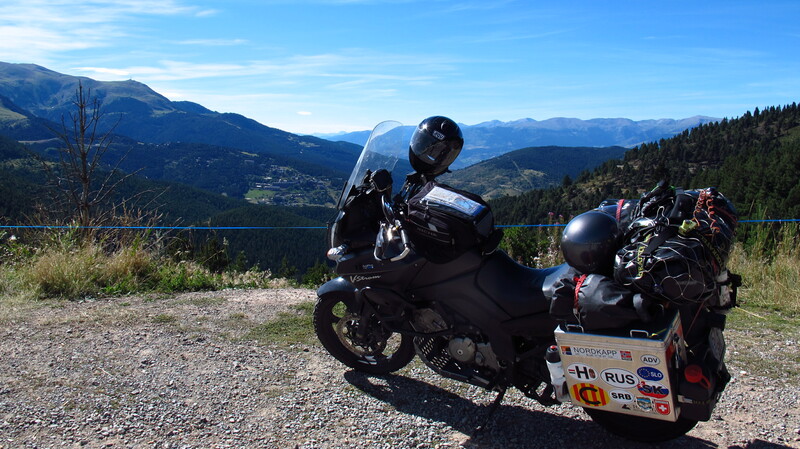 Motorbikes have a discount on French motorways, and as I had decided that I did not want to enter my country through the motorway along the coast, but through the Pyrenees, I took the motorway for the first part of my way back home. Shortly after I got back onto the autoroute, I stopped for breakfast at one of those great French service stations and was soon reunited with my old friend, the wind. I had not had such strong winds since the start of the trip except for the beginning of that sand storm in Kazakhstan which blew away my leather gloves. A few hours of fighting the wind on the motorway later, I found myself thinking that after all the weather conditions I had ridden through, I was surprised that this was the one I was hating the most. The strong winds were made even worse by the turbulence created by trucks and vans, and I got so sick of it that in the end I turned off the motorway much earlier than I had planned to and went back to country roads, as I would me more sheltered from the wind there and travelling slower would mean less turbulence from other traffic. It was not much better… France is a great country with many things to see but unfortunately, most of those things are not in central France. I rode through miles and miles of small sleepy towns, fields, some industrial areas, more fields and more sleepy towns, still accompanied by the wind and having to endure hundreds of old people trundling along those country roads on their Citroën Berlingos at 20km/h. If you go to France as a tourist, there are wonderful things to see. In my case, I was going on a very long tour starting in Barcelona, which meant that France was a country I had to ride through before I got to the interesting bits. If I ever do something like this again, I think I will just take a ferry to Italy and then to the Balkans and just bypass it. I finally made it to Perpignan, where I wanted to turn west and head for the Pyrenees. It was already lunchtime, so by the time I had left the big town and the industrial parks that surrounded it behind I started looking for a place to eat. I wanted to find a nice small town restaurant and enjoy one last meal on the road, but it was not to be. I wonder if it was a national holiday or the French simply do not like to work on Mondays, but I did not manage to find a single thing open in the towns and villages I rode through. I also needed to fill up again, so I was heading to a supermarket petrol station I had found on the GPS, and since I had not seen an open restaurant or bar, I thought I would buy something there and just find a nice spot by the road now that I was closer to the mountains. That option was quickly discarded as I rode onto the supermarket car park. Not a soul in sight, all shutters down and only a couple of credit card-operated petrol pumps in the scorching sun to greet me. I filled up, and as I was still wearing the inner lining in the jacket and pants –it was cold in the morning- I started to take them off without even pushing the bike away from the pump. Sure enough, as I was in the middle of my striptease, not one, but three cars, a motorbike and a guy on foot carrying a jerrycan turned up to use the damn pump. Where did they come from!? I had ridden across the whole town and it was completely deserted! I moved the bike away and finished changing clothes while a middle-aged mademoiselle tested the other four people’s patience by taking her own sweet time to figure out how to use her card to pay for the petrol. I rode on trying to find somewhere to eat, and in the end had to give up and stop at the only place I found open. A McDonald’s restaurant. Yes. A McDonald’s burger. In France. On my last day. I could not believe it either. At least the day got better once I rode past Prades and up the N116 heading for the border. I had been on that road countless times coming from my side of the border, as I normally go skiing in that area, and it is an amazing road, but I had never been any further than Mont-Louis. On clear days you can look down the valley from there and see the sea in the distance, and I had always wanted to do that last part of the road leading down to Perpignan. What a road and what a way to get back to my country! I rode up the winding road all the way to the part I already knew, enjoying the beautiful afternoon and the stunning landscape that these old familiar mountains offer. Down in La Cerdanya, I crossed one last border and finally entered my dear home land. As I said, I usually come up to this area to go skiing in winter or hiking in summer. Coming from Barcelona, there is a tunnel that gets you here faster, but you have to pay a toll to use it and it is not cheap. However, most people, myself included, prefer to take that route than the mountain pass above, as it takes too long and is tiresome to drive it. It had been quite a while since the last time I took the pass, and I had forgotten what a great road it is. Since it was a Monday, there was nobody on the road and I had it all to myself. I had a blast riding up to La Collada, taking the engine to the red line with every gear change, leaning into corners enjoying the perfect tarmac, the flowing road and the breathtaking scenery. I stopped at the top of the pass and as I took in the views I thought that there was no better way back home. It is funny how travelling such long distances puts things in perspective. When I come here, the journey home at the end of the day usually feels long, you are near the border, in the mountains, a long way from Barcelona. When I got back on the motorbike I saw that the GPS indicated I had 140km to my flat. All throughout the trip, when I saw that I had 150-100km to get to my destination on the GPS I had the feeling that I had already made it and that I only had to ride the last few km into town and find the place where I was going to spend the night. I laughed and took the first corner down that familiar road. I made it to Barcelona very quickly and run into the late afternoon rush hour. My motorbike and my riding suit were covered in dirt, dust and insects from the last 14 countries, my face was unshaven and sunburned and I had a stupidly big grin on my face. 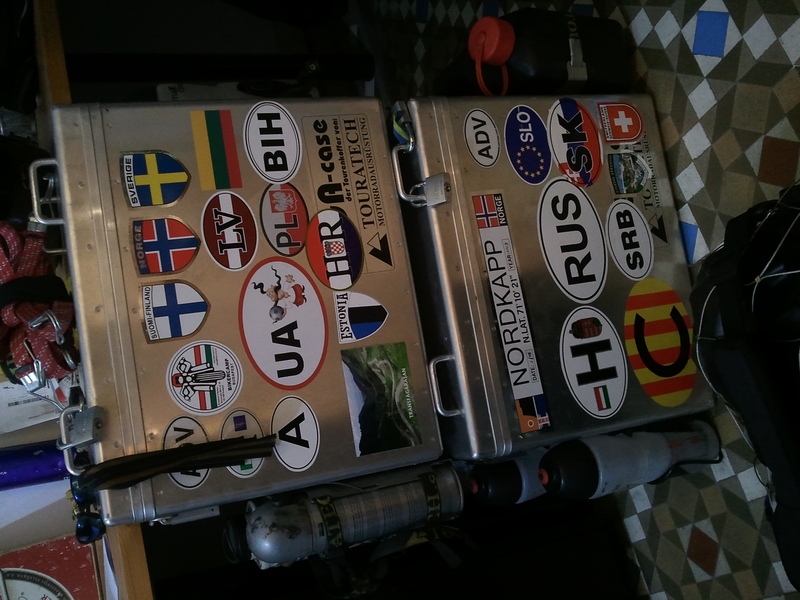 People looked at me in traffic lights as if I had got lost on my way to Dakar. I took the Gran Via to get to the center, and there is a big elevated roundabout where it meets the Diagonal. The sun was already low when I rode up onto it, bathing the city in a warm orange glow. I stood on the footpegs, looked at the sun going down beyond the Sagrada Familia, closed my eyes for a second and thought ‘I’m home’.